History was not driven solely by bearded elders—a fact we tend to forget, looking at portraits of the bewigged and edentulate, that the subjects started in youth and vigor. 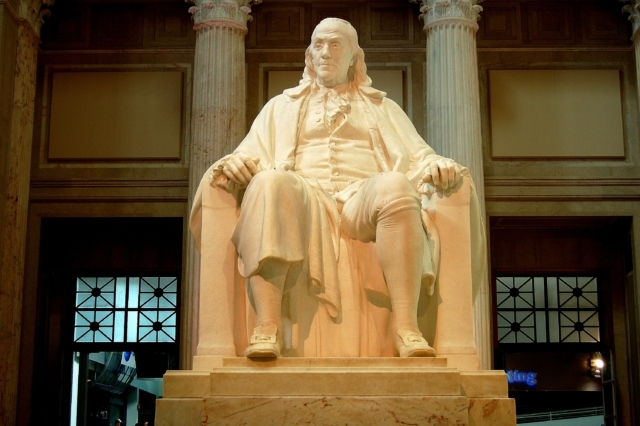 Benjamin Franklin, born in 1706, had a scant two years of formal schooling, was apprenticed to his father’s shop at eight, then to his older brother James at ten, where he learned the printer’s trade. George Washington, born in 1732, had what amounted to, roughly, grade-school level education. He learned surveying, and was hired to lay out lots in the Shenandoah Valley. By 1750, still 18, he had invested in land, and in 1753 carried a message into the wilderness while spying on the French; the start of his military career. Another young man was John Adams, the cranky, future first vice-president and second president. Younger by three years than Washington, Adams entered Harvard at 16 yet, despite his own talents, remained jealous and critical of the winsome Franklin and the robust, charismatic Washington. Adams was self-aware. Speaking to 33-year-old Jefferson, about to pen the Declaration of Independence in 1776, he conceded, “I am obnoxious, suspected, [and] unpopular…and you can write ten times better than I can.” Franklin, then 70 and also aware, made a crucial edit to Jefferson’s text. He struck three words, changing, “We hold these truths to be sacred and undeniable,” to “self-evident,” altering the phrase from an assertion of religion to one of rationality. Each of these varied individuals began careers when “just kids.” Polymath Franklin, inventor, statesman, writer, and wit; Washington’s military prowess led to our country’s independence and the presidency; Adams’s opinionated perseverance (he would not have appreciated the number “Sit Down, John!” in the musical 1776). Our country depends on the fresh eye and energy of youth as well as the wisdom that (sometimes) comes with age. We need to remember that and listen to the future.